Originally planned as a heavy tank and troop transport glider, and first flown on 25 February 1941, the Me 321 V1 prototype had a single-crew member and a substantial cargo hold that could accommodate some 200 troops or 20,000kg (44,092lb) of freight. The Me 321A-1 entered service in late in 1941, followed by the Me 321B-1 with a crew of three and two defensive machine-guns. Luftwaffe transport pilots found that the Me 321 handled adequately in the air, but lacked a suitably powerful tug (even the extraordinary five-engined Heinkel He 111Z proved inadequate). This led to further development as the Me 323 with multi-wheel landing gear, structural strengthening and six Gnome-Rhòne radial engines from captured French stocks. The initial production variant was the Me 323D-1 with the ability to carry a payload of 9750kg (21,495lb), including 120 troops or 60 litters, over a range of 1000km (621 miles). 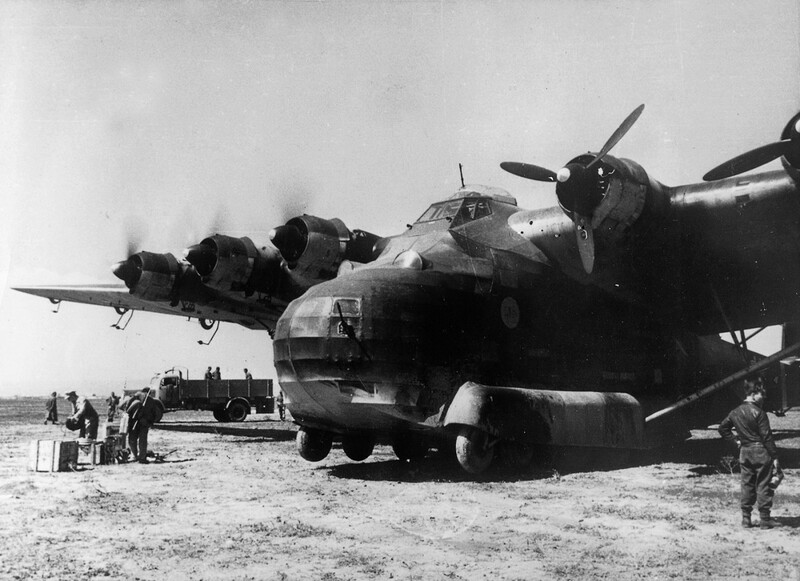 Deliveries began in August 1942, and in November of the same year the Me 323Ds were put to work supplying Rommel’s beleaguered Afrika Korps across the Mediterranean. The lumbering giant proved easy pickings for Allied pilots and heavy losses were suffered. Later models included the Me 323E, with stronger structure, greater fuel capacity and heavier defensive armament.